Mike at Precision Bend & Machine contacted us a little over a month ago asking to get an affordable website design completed for their small business. We then worked with Rick to add the content and information to the website. Rick had us add several different backgrounds to his logo, but nothing was working to their satisfaction. The trouble was that the logo they provided was a JPG file that had a white background behind it. In the end, Rick then had our graphic designer turn their JPG logo into a PNG logo – one that is transparent and wouldn’t have the white background behind it. Once the logo modification was completed, we finished up the rest of the website. Rick noted in an e-mail to us – “You guys have really moved quickly on this. Nice job!”. We appreciate the business and the trust that Precision Bend put in BsnTech Networks for the creation of their website. 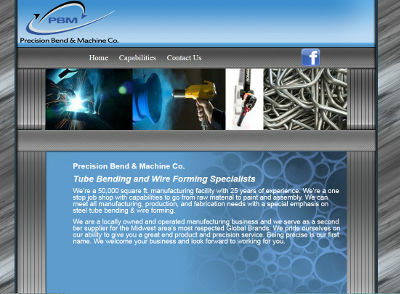 Precision Bend’s website is at precisionbend.com.